I put this photo on my kritterspaw.com site, but it bears repeating. We saw what we thought was a little bird, huddled up on a branch. It seemed roundish, as it shivered and squatted itself all together during our snow storm. Then it turned and looked at me. I couldn’t believe it. It had that unmistakable face… it was an owl. It wasn’t much bigger than a sparrow… maybe 4 – 5″ tall. Apparently it’s a Pygmy Owl. To be specific, a Northern Pygmy Owl. The most common one I could find (in AZ) is from southern AZ (Tucson area). It has been on and off the endangered species list, with only 28 sightings in 2014…. none noted to be in Northern AZ. It’s no wonder really… they are so small. 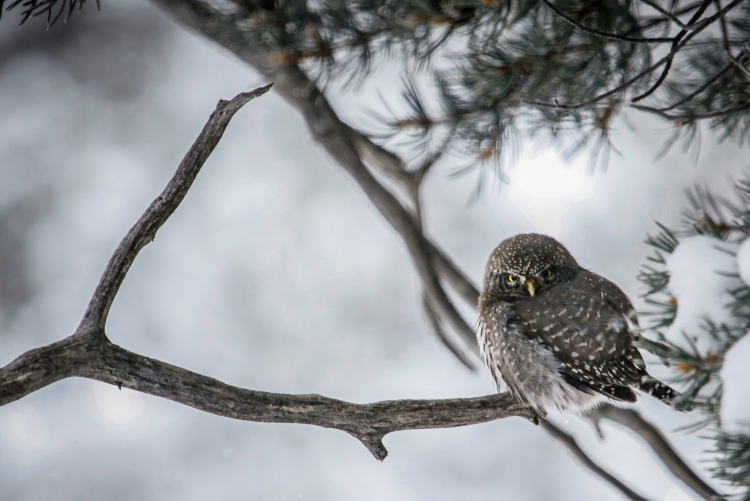 The pygmy owl eats insects, lizards, rodents, and small birds as large as itself. I’d love for it to come back, but it may be a once in a life time sighting. I’m so happy we saw it… and got a decent photo! That’s really a cool picture, and a great story too! really fun picture. And it looks the owl is looking straight at you!